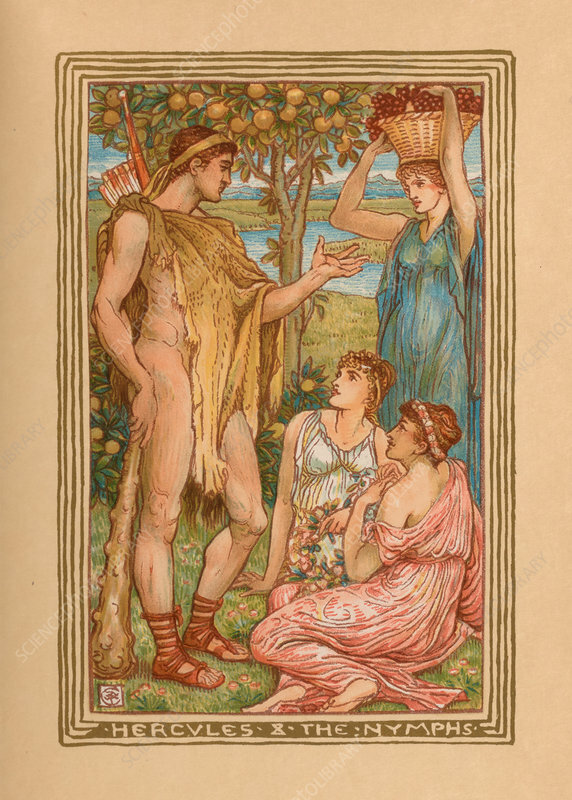 The Three Golden Apples, recounts the story of Heracles (Hercules) stealing the Three Golden Apples from the Hesperides' orchard, with the help of Atlas. After Hercules killed his wife and children, he went to the oracle at Delphi, and prayed to the god Apollo for guidance. Hercules was told to serve the king of Mycenae, Eurystheus, for 12 years. During these 12 years, he is sent to perform twelve difficult feats, called labors. Nathaniel Hawthorne (1804-1864) was an American novelist, dark romantic, and short story writer. His, A Wonder-Book for Girls and Boys, first published in 1851, is a children's book in which he retells several Greek myths. Walter Crane (1845-1915) was an English artist and book illustrator. Printed at the Riverside Press, 1893.